Looking for a workshop in which you’ll learn to write your own memoirs or poems? As a prize-winning poet and veteran foreign correspondent in Israel with The New York Times, Rick Black spent a number of years on the front lines and in Jerusalem, where he reported on everything from new Israeli settlements in the West Bank to the waves of Russian and Ethiopian immigrants and the first Persian Gulf war. Combining his journalism experiences, knowledge of Hebrew poetry and his own writings, Rick provides audiences with a moving insider’s glimpse of what it’s like to live in Israel today. In addition, he offers workshops to help enable people to write their own memoirs or poems. To book Rick for a speaking engagement or workshop, or just to learn more about one of them, please feel free to contact him. Reading the poetry of Yehuda Amichai, one of modern Israel’s leading Hebrew poetry figures, is like taking a journey through Jerusalem as well as modern Jewish history. Born in Wurzburg, Germany, in 1924, Amichai emigrated with his family to pre-WWII Palestine, served in the Israeli defense forces in the 1948 War of Independence, studied Bible and Hebrew literature at Hebrew University and then became a teacher. In his Hebrew poetry, Amichai often draws on his own personal experiences of war and love. 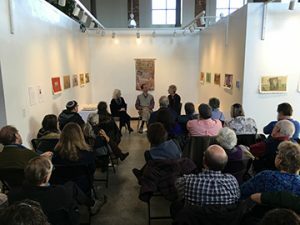 When TLP founder Rick Black spent some time with him in Philadelphia, Amichai told him, “Love can not save you from war, but it can help you deal with the pain.” The same could be said of reading his poetry – it’s a way to keep one’s emotional balance and sense of humor in the face of grief and loss. Rick Black has now completed his artist book, The Amichai Windows, a limited edition of 18 Amichai poems combined with collaged images from archives around the world. Please let us know if you’d be interested in having an exhibition, reading or program. Experience a young woman’s love of the Kinneret and working the land, stroll through the alleyways of the Old City, be on the battlefield in the War of Independence, go to the shuk just before a suicide bombing, and listen to the complaint of a recent Russian immigrant selling falafel – all through the poems of Rahel, Leah Goldberg, Yehuda Amichai as well as my own poems. Life in Israel is infused by images of peace and war, hope and fear. I read a variety of Hebrew poetry in English and Hebrew and also reflect on being a reporter in Israel and how haiku poetry – those imagistic, short poems that we all think we learned how to write in grade school – enabled me to recover from the trauma of reporting on so many violent events and reaffirm the small, but treasured moments of life. To cap off the evening, I will discuss how I came to make Peace and War: A Collection of Haiku From Israel and will read from the collection in order to transport you to Israel and give you a sense of the complexities of daily life today. Having been a reporter in the Jerusalem bureau of The New York Times for three years, from the outbreak of the first Palestinian intifada in 1987 through the Scud missile attacks in 1991, I had to find a way to understand and relate to the situation outside of the world of journalism, whose narrow parameters forced me into an “off-the-shelf,” ready-made kind of writing. Reporters are not concerned about the olive tree that happened to be blown to smithereens in a suicide bombing; rather, the facts of the story are what’s important to editors: how many dead, who did it, why, where, etc. In this talk, I discuss the ins and outs of daily reporting in Israel and why I decided to move in the direction of poetry and bookmaking. And, in particular, the Japanese poetic form of haiku, which has enabled me to regain a balance and to come to accept life in all its complexity. I will discuss how I came to make Peace and War: A Collection of Haiku From Israel and will read from the collection in order to transport you to Israel and give you a sense of the complexities of daily life today. Everyone has a story to tell, whether you are 94-years-old or 39-years-old. Sometimes, these stories take the form of fiction, other times poetry. We will do a handful of exercises aimed at increasing one’s awareness of past experiences, decide what form is the best for you and then share them with others. You might want to recount your memoirs in the first person, or capture specific memories in the form of a haiku poem. In this workshop for adults, we try to slow down in order to become more aware of the world around us and savor our experiences. We’ll read a handful of poems by Japanese and American haiku masters, do exercises aimed at increasing our sensitivity to the world around us, and go for a short ginkgo (a walk whose specific purpose is to write haiku). To conclude, participants are invited to share their poems over refreshments. Same program as for adults except that it is geared to teens.